Independence Day is approaching and Necco Sweethearts has introduced a new line of red, white and blue conversation hearts featuring 13 patriotic messages like "Proud of You," "Home Safe", and "Miss You." Thanks to Sweethearts, we had a chance to try out the new strawberry, vanilla crème and blueberry flavored treats. They are yummy to eat right out of the box but also work as colorful toppings for baked goods. 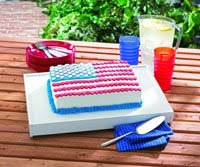 We're hoping to make some patriotic cupcakes this weekend and decorate the tops with the Sweethearts. 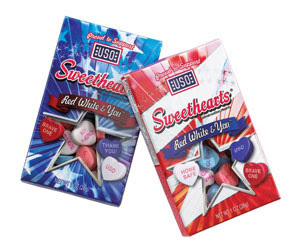 Red, White & You Sweethearts are a great way to show appreciation and support for the military this summer. Sweethearts has partnered with United Service Organizations, Inc. (USO). According to Sweetheart's facebook page, "the new Sweethearts brand is providing a $75,000 commitment to the USO to benefit the Operation USO Care Package program. In addition, a Web site for consumers to make their own donation to the Operation USO Care Package program has been set up at http://www.uso.org/sweethearts." Consider sponsoring a care package this year as a way to say "thanks" to the many men and women serving our country. The new Sweethearts make great 4th of July favors and decorations! Looking for some neat 4th of July crafts and treats? Check out the downloadable Sweetheart Patriotic Craft Booklet [pdf] for some wonderful Sweethearts inspired ideas including a Red, White & You™ Flag Cake. We'll post a picture of our cupcakes after this weekend, hopefully for next week's Wordless Wednesday! Thanks to Twitter Moms and Necco Sweethearts for the review opportunity. You won the $100 Amazon gift card giveaway at little people wealth :) Come on by to claim your prize! Thank you for sharing this! These are just perfect for our party this weekend! Those are just too cool. Thanks for sharing the info. And, thanks for stopping by my blog. Have a great July 4th weekend. Cool Sweethearts. They would be a nice treat for the fourth.